Add excitement to any project! Color or texture any item that you have spread glue onto first -- it adds excitement to any project! Fine terrarium sand works well in plastic cups to make scenic sand designs. It is great for use with sand art boards. Select from our beautiful array of colors. In 2-lb. bags (Shaker Top containers not included). 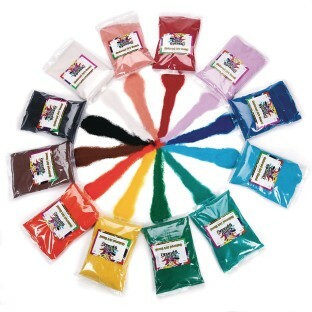 Great vibrant colors for a craft that kids love! Great for Sand Art projects. Kids love playing with the variety of colors. Product arrived quickly and was a huge success with the kids who used them! I'm going to use it for the fair I am holding at my Personal Care home I filled mason jars with it and stuck in faux flowers. Came out wonderful ! The description says that these are true colors. I needed sand for a July 4th wedding reception but both the red and the blue are way too light. The shipping was too expensive to send them back so I am stuck with sand that won't work. Ugh. Quality Sand AND Beautiful Colors! Excellent Quality Sand AND comes in a variety of Beautiful colors. This sand is the best on the market.